Gardner mattresses are uniquely created to provide customers with a superior, restful sleep. 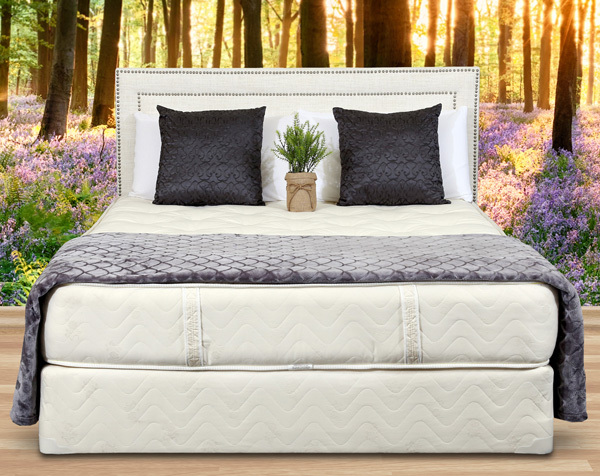 Natural materials and tufting by hand make Gardner mattresses a great option for those looking to avoid unnatural materials and uncomfortable sagging. Listen or read more to hear from Kirk Forsyth, General Manager at Gardner Mattress, to find out why Gardner mattresses are so special. Katlyn: Thanks for joining us today. We’re discussing the manufacturing process of mattresses that happens at Gardner Mattress. A very unique process you have going on over there. This whole process takes place in your factory in Salem. What kind of materials are you using? Kirk: We definitely specialize in using a lot of natural materials. Our main filling material for a lot of our Innerspring and Pocketed coil line is cotton batting. We also back that up with using a lot of wool, as well. Wool is the next more natural material that we use. These materials wear great. The way we upholster them, they sleep much, much cooler than high levels of polyurethane foam, latex, those types of things. That’s really where we specialize. Katlyn: I like the idea of natural materials and no chemicals in my bed. Getting to the manufacturing, what is the first step in building a Gardner mattress? Kirk: When we get an order that comes through, the firmness is already specified for us, so we’ll use a particular coil, at which point, to determine the firmness. Then we start by reinforcing all the edges of the Innerspring and then start layering layers of insulator pads to protect the raw materials from going into the springs, also building up the center with what we call “crowns,” another type of insulator pad that wears most of our body weight, as we like to build that are up. Katlyn: It sounds like it’s going to be really individualized, depending on what your client has specified that they want. All these different layers will be different materials, am I right? Kirk: That’s correct. The firmness is determined specifically by the spring. We have a variety of coils we work with to determine the firmness, each of these being individually manufactured for each customer. They can be as custom as you like. We have very specific builds that we do on the floor, but if they need to be tweaked, we can do that, obviously, because we make them for each customer. Katlyn: Where did we leave off? You put in the layers. The springs are in. You’re doing the edges. What’s next? Kirk: After that, then that’s when we get into the upholstery part of it. We’re adding in these natural materials, layers of cotton, potentially wool, foam potentially, or even latex. At that point, once all those layers are upholstered in the proper sequence, we then go into the covering process. Katlyn: Is this the tufting I’ve heard that you specialize in? Kirk: Not quite. We’re almost there. Once the fabric that has been chosen is upholstered on top of our filling materials, we then actually close off the mattress by tape edging or sewing the border — which holds the top cover to the bottom cover to the mattress — just to close it all up. That creates about a 12‑13 inch, almost finished product. Then, we go into the tufting process. Katlyn: The tufting. This is what makes a Gardner mattress unique. Kirk: Tufting, basically, is the process of pushing strings through the mattress and then hand tying them on the back to pre‑compress them so that all those layers that we’re using don’t settle or sag over time. Superior wear determines some of the firmness of the mattress, but, mainly, that’s due to the strings. The tufting really is what makes our product very, very different than all your big manufacturers which tend to use a lot of foams in their mattress and just layer them on one side. Tufting really compresses our materials so they do not settle and sag over time. Katlyn: The tufting allows for less sagging? Kirk: Yeah. Basically eliminates it. Katlyn: That’s great. We just did the tufting. What happens next? Kirk: The tufting process is, essentially, putting a mattress into a big press, compressing about a 12‑13 inch product down to about 6 inches, us sticking strings through the mattress, hand tying them on the back with a double knot and a bow, and then releasing the press to a finished product. That finishes it [at] about eight inches. We’ve taken quite a bit of filling material and compressed it all down so that, once it’s tufted, it’s a finished product. Katlyn: You mentioned hand tufting. Do you really do this process by hand? Kirk: All done by hand. Basically, a handle with two very long needles, very sharp needles that are hand threaded and then pushed through the mattress in a specific design and pattern to be consistent all the way across the product. Then, once they’re all through, the same guy goes around the backside and hand ties them all. Katlyn: Attention to detail. My goodness. Katlyn: After this process, you’re done. You deliver the mattress. How long does this normally take? Kirk: Depending on the size of the mattress and the build that we’re doing, it can take anywhere from an hour to two or three hours — start to finish — to create the product for each person. Katlyn: Not that long at all. Kirk: Not that long, but it’s a lot longer than what you will see in a lot of the big factories around the country that make a different style of mattress. Those products may be upholstered by one, maybe two people. This, actually, is going through four different stations to create our product. Katlyn: … Using natural materials and really putting some time and effort into the mattress. Kirk: Absolutely. These are the best materials we can get. Obviously, they’re much more expensive than many of the manufacturers’ materials that are out there. Because we’re using these types of materials, these extra steps are essential to creating the quality product that we do. If you didn’t tuft cottons, and wools, and high‑loft natural fibers like that, they would tend to compress, and settle, and sag — which is what we’re not trying to do. We’re trying to create something that’s very consistent and long lasting. Katlyn: It sounds like you have and are helping people sleep all over the place. Thank you so much for explaining that, Kirk.